I have bought two of these stools. They are very sturdy. Excellent product. Very sturdy. Compact and takes up little space. Fits well in my small shower. I have had other shower stools and this is the best one I have ever had. I had them from medical stores and they are not as sturdy feeling and fit so good in the tub/shower as this one does. 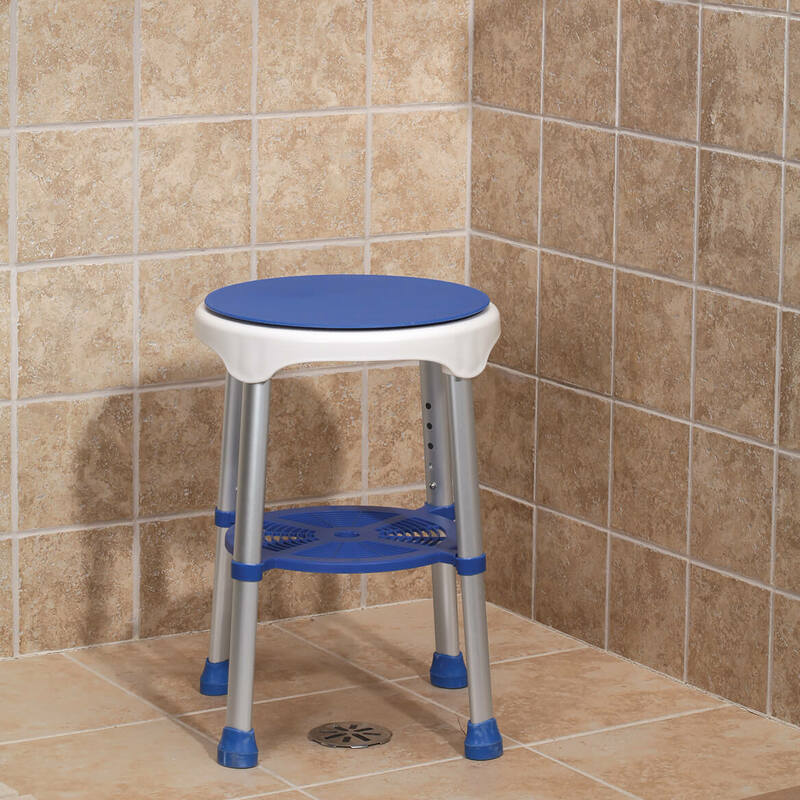 I am a plus-size woman and I have been searching for a stool or chair to use in the shower/tub that I felt secure using. I am slightly handicapped and this stool is very comfortable, lightweight and it air drys quickly. Love this stool, can be used anywhere, I'd love to have another, but can't afford another. This would be a great idea had they just tested it in any average size shower. It's just way too short for any adult to utilize effectively. I hope they design to adjust to a higher height and then I would definitely purchase. Idk how this would ever be useful or effective for anyone as it is. Kids I'm sure would love to use as a stool and spin on it, that's about it as is. Shame, it would be great if just made to adjust higher. Idk why they did not even make it the average adjustable height of other shower chairs & stools. It doesn't even reach 2 feet! 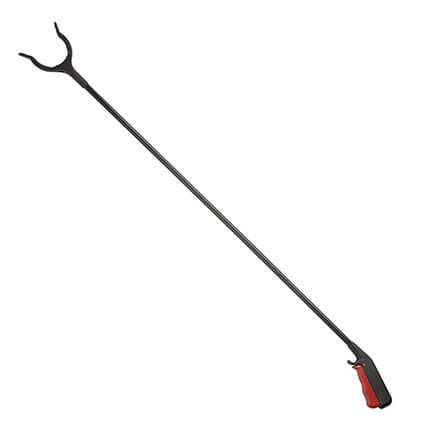 You'd never reach a shower head or hand held shower without standing up each time. Such a shame truly. Needed one and price was reasonable. Really need it lately for the shower. Family member needs to sit while showering. I have a stool with 3 legs, and it has tried to tip over a few times. I feel that this one, since it has 4 legs will be much safer. love the color. Also need help in the shower, shaving legs. I can not raise and hold my leg up any more. I had a stoke and this will fit in my shower. I need a new one. This looked like it would work well for me. for our new walk in shower. I currently have the unmoveable bench. I look forward to having more movement. I am a senior and need the shower chair, I have been looking for a round one for quite some time now. Cant wait to get it. I love the idea of it swiveling a 360 turn. I fall or lose my balance sometimes in the shower. Needed a good one for my bathroom. A must for me in the shower. THE SHOWER CHAIR I HAVE NOW IS TOO BIG WHICH HAS CAUSED IT TO BE MISSHAPPEN & DANGEROUS. THIS STOOL IS THE PERFECT SIZE & IT SWIVELS! 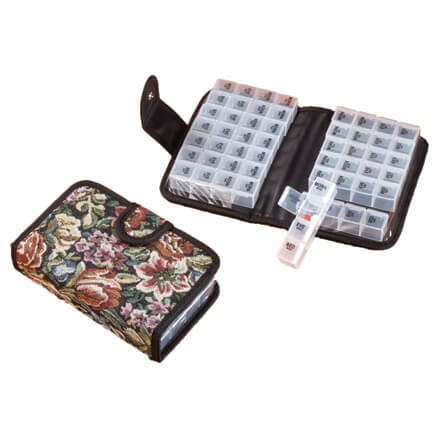 For use in a craft room folding table. I needed something small, that would allow me to swivel. This fits the bill. 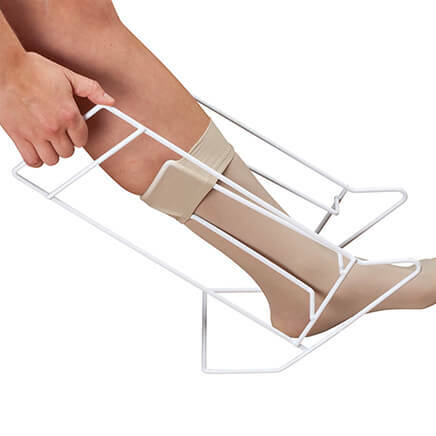 Reviews stated it was too short for anyone this is exactly what I am looking for something shorter than the average bath stool. 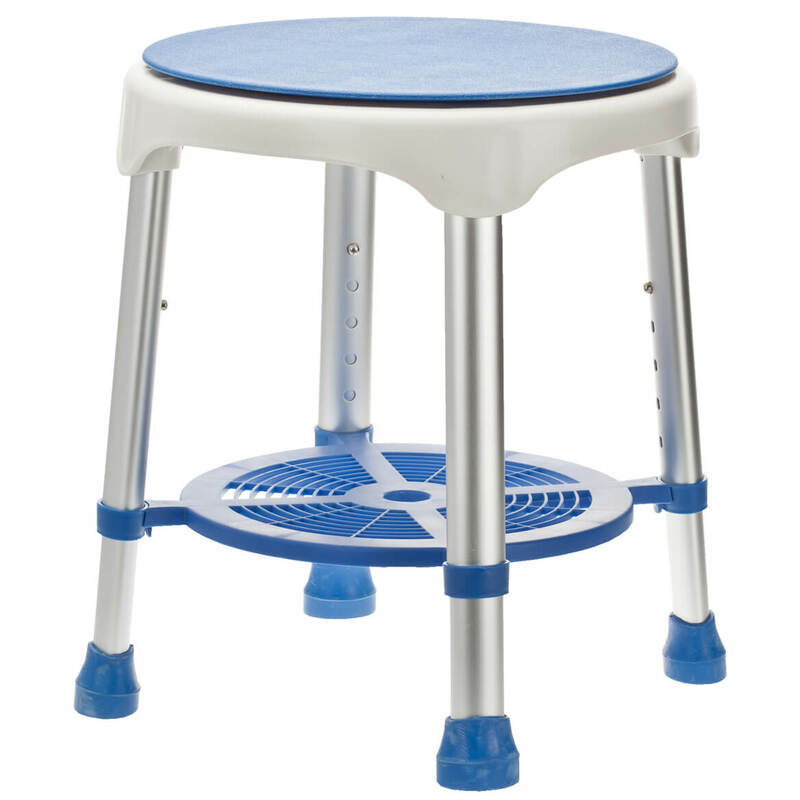 My mother needs a compact stool with higher seating for use in her shower. Quality and value pricing. Great product. Compact and very user friendly in the tub as well as outside at the vanity area. Love it. I now have one in each bath. Is this made by manufacture company called Drive ? BEST ANSWER: Thank you for your e-mail. Since we have a contractual agreement with our present and former vendors to keep their identities anonymous, we are not able to forward their information to you. They are not prepared to accept calls and emails from the general public. We apologize for any inconvenience. What size is the footprint of the stool? Want to use in our camper shower and as the legs slant out so we need to know much room we need on the bottom of the tub to use. Thank you. The blue center piece in the middle of the stool is also hard plastic and 11 ¼” diameter and ¼” thick. 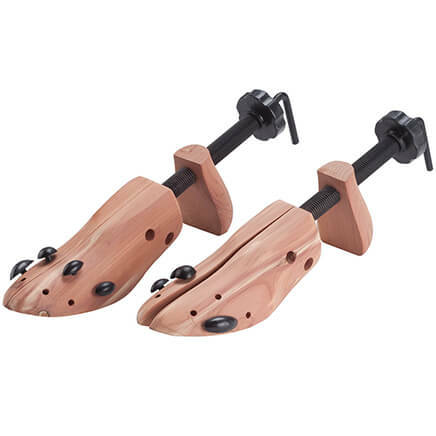 The feet are soft rubber and oval shaped. 1 1/8” thick across longest length and 1½” across at shortest length. The feet are 1 ¾” High and would be very difficult to remove. 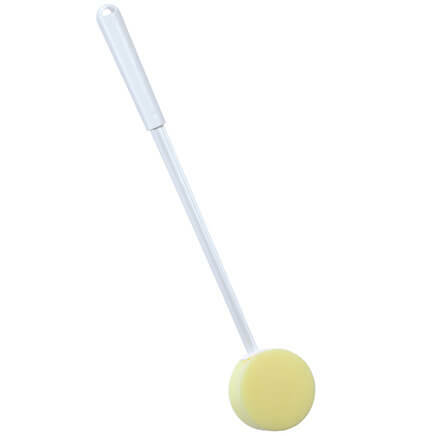 The leg poles are also oval shaped. They are 3½” circumference. When at lowest setting the blue seat is 16½” from the floor, when at highest it is 20½” from the floor. The distance between the legs on the floor is 13 3/16” – they angle in very slightly as you go higher up the stool. We hope this information will be of help to you.